Phonak hearing aids have been around a long time. In 1947, when man broke the sound barrier, the first Phonak hearing aids were being developed. They’ve come a long way from those breakthrough portable hearing devices. Today, this Swiss company is still breaking barriers. Phonak produces hearing aids that are sleek, use cutting edge technology, and ensure you maintain your connections to keep your mind dynamic. Autosense OS automatically based on your environment. Direct phone streaming for both iPhones and Androids. Excellent performance in noisy environments. AutoSense OS adjusts to your environment. Phonak understands what it means to hear. Their advanced hearing aid wireless technology will enable you to remain in the present, create memories and experiences, and stay connected with those around you. For Phonak, life is on! Because Phonak has long been the leader in hearing aid technology, they will more than likely have the answer to your hearing needs. Their hearing aids will provide innovative listening solutions for you. So if you are looking to improve your ability to hear speech in difficult listening environments, models such as the Audéo B, Virto B and Bolero B, will suit your needs. Here’s a breakdown of what to consider for these hearing aids. Behind-the-Ear (BTE) – the most familiar style of hearing aid with all components cased in a piece that sits behind the ear. Receiver-in-the-Canal (often referred to as RIC or RITE) – this style has a small device behind the ear with an ultra-thin tube carrying a wire to a small plug (dome or mould) in your ear. In-the-ear (ITE) – a custom made hearing aid, where a hearing professional takes an impression of your ear. This larger custom style is easier to handle for those with dexterity issues. The higher the performance level, the more features you will find on the hearing aid and the more programming ability your hearing professional will have to customise your device to your specific needs. Autosense – up to seven programs that will automatically change, depending on the listening environment. You can also change programs manually, but Autosense does such a great job detecting the listening environment for you, you may not need to use this function! Binaural VoiceStream technology – helping you zone in one a single voice in difficult listening situations, this feature includes Speech in Wind (improving communication outdoors), Speech in 360° (clearer speech in most background noise situations) and DuoPhone (no matter which ear you hold the phone to, both hearing aids will pick up the caller’s voice). 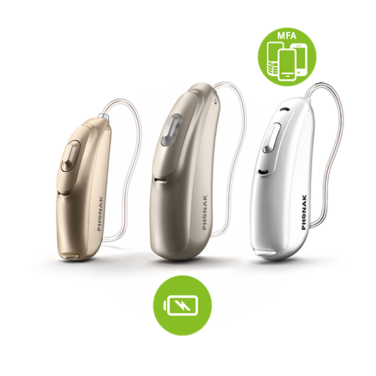 Bluetooth streaming – standard in most hearing aids these days but, in another first for Phonak, they have developed a Bluetooth hearing aid with universal connectivity to any Smartphone or TV. You will find this unique feature in the Phonak Audéo and Bolero B-Direct models. The Audéo B includes the B-Direct, B-10, B-312, B-312T, B-13 (the number indicating the size of battery) and B-R (rechargeable battery). The Audéo B range comes in a sleek RIC model with plenty of technology squeezed into the casing. Bluetooth capabilities, AutoSense & Binaural VoiceStream are found in all Audéo B models. In the higher performance levels, programs for Music (fuller and richer music experience), Speech in Loud Noise (StereoZoom – better speech intelligibility in loud noise), Speech in Car (improved listening in the car), and Comfort in Echo (less distortion in reverberant conditions) can be included. Is this hearing aid for you? The Audéo B hearing aids are for you if you want great technology for improving hearing in all listening situations. Audéo B-Direct – This is the hearing aid with universal Bluetooth connectivity to any Smartphone. The phone can be up to ten metres away with all the functionality still available (answer, reject, voice and volume use). There’s a connector for the TV, beaming sound directly to your hearing aid. This will give you the best possible listening environment for your favourite TV shows. Answering your phone from your hearing aids is a useful convenience. Having your callers streamed directly into your hearing aid will mean hands-free at all times. 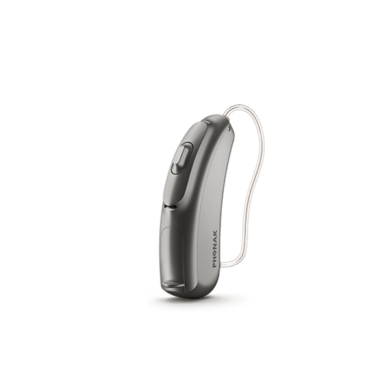 Add this to direct TV connectivity and this hearing aid provides great communication extras, along with the usual Audéo B features. If this is what you need, then this hearing aid is the one for you. Audéo B-R – For the sustainable minded, this model has a rechargeable built-in lithium-ion battery, providing 24 hours of hearing. The rechargeable battery is lighter and more powerful than anything else on the market today. Are you looking to help save the planet and freedom from changing batteries? 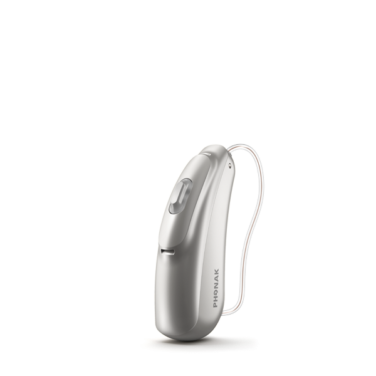 You can feel good about this hearing aid with its superior listening features, Bluetooth connectivity and automatic capabilities. If you want to make your life simpler and more sustainable, this is definitely the hearing aid for you. 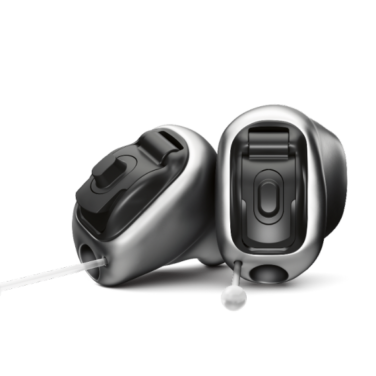 Virto B – These are the custom in-the-ear hearing aids made with Phonak’s Biometric Calibration. The software used to develop your custom-fit device analyses the individual characteristics of your ear canal and calibrates your hearing aid using this information. In a discreet casing, the devices include the Belong features of AutoSense, Binaural VoiceStream and Bluetooth streaming capabilities.The Virto hearing aids, like the Audéo family come in a range of battery sizes. Keep in mind, the larger the battery, the larger the hearing aid is in your ear. Available in all four performance levels, relax knowing you will be well-connected to the world around you. If you want a smaller custom-made hearing aid, with automatic capabilities and improved hearing in most listening situations, you should consider the Virto B range. Virto B-Titanium – Enter a virtually invisible hearing aid. Yes, it’s made from titanium! This amazing device is hidden deep in the ear canal. It too has AutoSense and Binaural VoiceStream features, but the Biometric calibration, teamed with titanium, creates a unique product. The strength capabilities of titanium enable a thinner shell to be built around the hearing aid technology. There’s room for venting, if required. This means your voice, and overall sound quality, will sound more natural. You can elect to have the hearing aid totally automatic, or add in a manual control (push button or ‘MiniControl’) to adapt the volume to your needs. Available in Advanced and Premium performance levels, the Virto B-Titanium will give you a super discreet hearing aid that sits deep in your ear canal. With excellent sound quality and comfort fit, these invisible devices could be what you’re looking for. 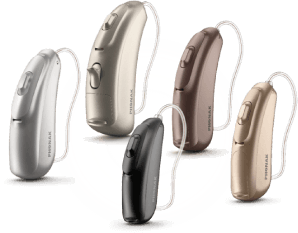 The Bolero B range of hearing aids provides the same technology as the Audéo B, in the BTE style and four performance levels. Depending on your level of hearing, you can select the thin tube or ear hook model. The main difference is that all the technology is cased behind the ear, including the receiver. This improves the dependability of the device, with no issues of debris in the receiver, as can happen in RIC models. If you are after a unified hearing experience in even the most challenging listening situations, consider the Bolero B as your device. The Bolero B-R model comes with a rechargeable battery. The Bolero family also caters for those in the moderate to profound hearing range. If you require more amplification, select the Bolero B-SP. 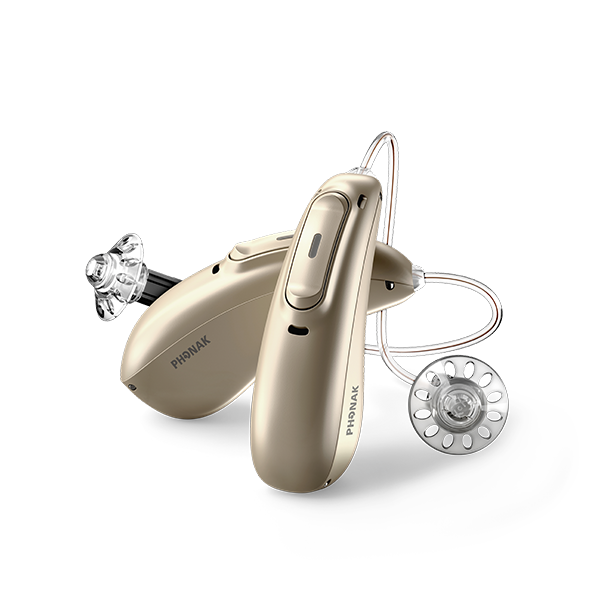 Phonak also produce the Lyric hearing aids which we dissect in more depth here. Navigate to our hearing aids page for information about every brand and product available on the market in Australia.